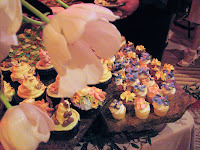 Over 600 paying attendees sampled spectacular desserts from nearly Washington area chefs, filling the banquet room at the swank Mandarin Oriental Hotel in Washington DC on Monday evening. The gala raised funds for the Heart of America Foundation to buy books and provide suport for at risk children in the US. Honorary chair was Sheila Johnson, owner of the Washington Mystics women's basketball team. Nearly 50 chefs created fabulous and often visually stunning confections. The wacky and very creative highlight of the evening was the parade of models actually adorned in candy, which had been applied on them by creative DC area chefs. This is the third year in which Annette Mayr-Nowe, one of the organizers from Albert Uster Imports, has invited Clipper City Brewing to be the only beer donator. I brought along Small Craft Warning Uber Pils, Clipper City Gold Ale, Loose Cannon Hop3 Ale, and Peg Leg Imperial Stout. The last one I selected specifically as a mate for all the chocolate. I was fortuitously placed adjacent to Carole Palmer, a board member of the American Cheese Society. 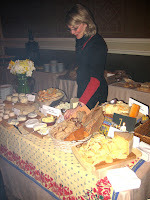 She supplied the cheese selections for the event, and what an amazing board it was! Several attendees paired our Loose Cannon Hop3 Ale with a particularly aromatic goat cheese and our Peg Leg Imperial Stout with one of her blues. There are plans afoot to have Carole and me co-host a beer and cheese dinner at Tuscarora Mill, in October 2007.